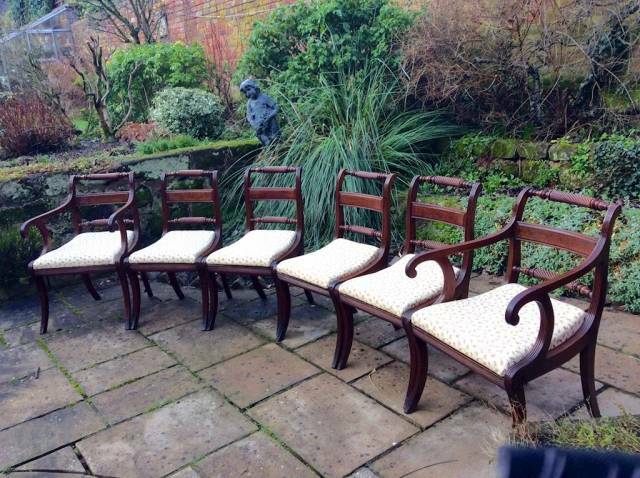 This very elegant set of chairs comprises 2 carver and 4 single chairs. They have the typical Regency rope twist rail that is both in the centre and the top of the chair backs. The legs are reeded and sabre. The front rail is reeded as are the lovely arms on the 2 carver chairs. The seats are dop in. They have been reupholstered. A handsome set of chairs. As always we guarantee the chairs are absolutely sound.